“To see a World in a Grain of Sand / And a Heaven in a Wild Flower / Hold Infinity in the palm of your hand / And Eternity in an hour...” So wrote William Blake in his poem, Auguries of Innocence. For him, everything was more than it seemed at first glance, but most of us never take the time to really see. For Vincent van Gogh, a dusky field in rural France became his great Starry Night painting. For Leonardo da Vinci, a business crony's wife's mysterious smirk became the Mona Lisa. Both were familiar if not ordinary until artists divined their depths. 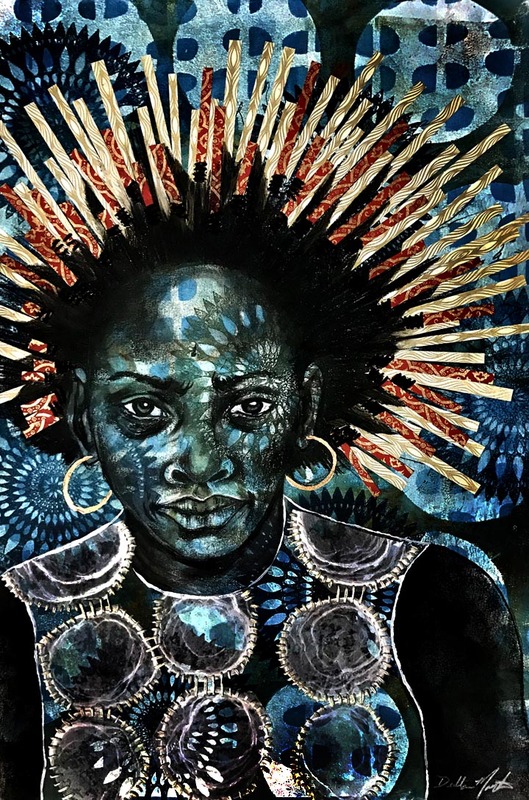 The stylized women in Delita Martin's mixed media works seem like ordinary folks, but she employs layers of print, painting and collage techniques to reflect the deeper mysteries of nature and culture that we all have within us. We rarely see such things except in dreams, but her best works channel those mysteries and make them visible as charismatic imagery. 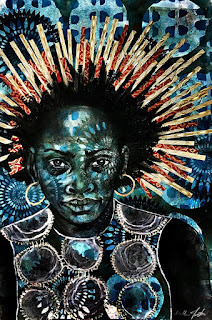 “Charisma” originally referred to the spiritual aura that radiates from saints in renaissance paintings, but Martin returns charisma to its earthly roots in works like The Light, left a charged view of a woman who looks possessed yet self-possessed, as ornately patterned rays shoot from her tightly coiled locks framing a face like an African spirit mask with eyes like windows into other worlds. She might be an athlete or a cop, but clearly there is more to her than a job description. How Then Shall We Remember is a head and shoulders portrait of an intense yet impassive woman sheathed in circular motifs that recall the bold patterns of tribal art that later influenced art deco. The familiar, “everyday people” aspect of Martin's salt of the earth subjects are like the street facades we all wear to navigate the world around us, but in works like Constellation, top, the broader universal context known to saints, seers and physicists suggests there may be more to “everyday people” than we thought. 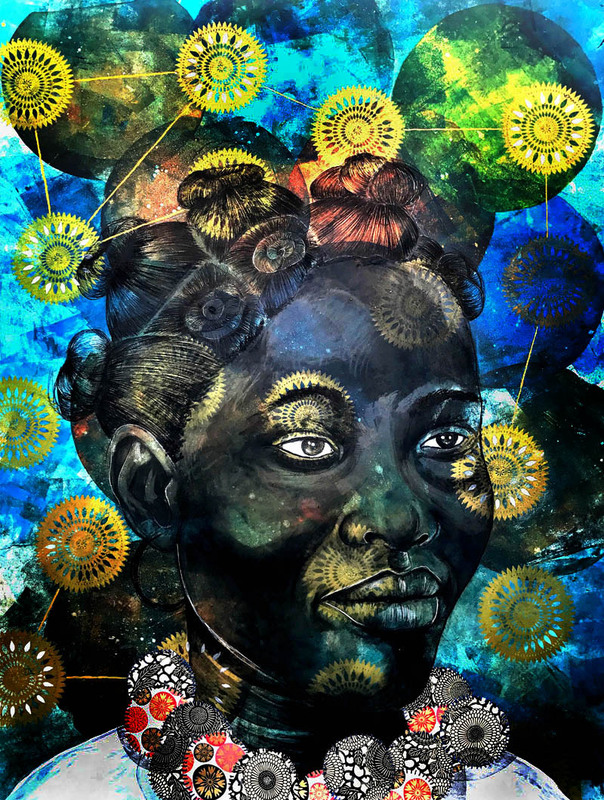 ~Bookhardt / ﻿Constellation: Mixed-Media Works by Delita Martin, Through Sept. 30, Stella Jones Gallery, 201 St. Charles Ave., Suite 132, 568-9050.